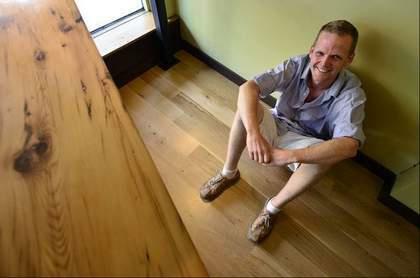 There’s a new wood flooring company in the area called Green Mountain Eco Floors, and it’s doing things a bit different than its brick and mortar counterparts. Oliver Welters and Cyrus Pond started the company in April. What’s unique about Green Mountain Eco Floors is that it’s developing partnerships with local loggers, mills and pre-finishing operations right here in Vermont.Welters, 27, said that most wood flooring is harvested in the Northeast, shipped to China for pre-finishing, then shipped back to America to be sold and installed. The result of the process, among other things, is that the boards are cut short in order to fit in the hull of a ship for transport. Shorter boards means more installation time, Welters said. What he and Pond are doing is that they work with local loggers who cut the trees, mill the wood and either pre-finish it themselves or find someone right here in Vermont to do it. Welters said he can get boards that are 10 feet in length. “It’s not more expensive,” Welters said. “It’s actually cheaper than what you can get from China.” In fact, he said, Green Mountain Eco Floors can beat brick and mortar-prices, from Home Depot for example, just about every time. And aside from quicker installation, Welters said that they are cutting out the brokers by buying wood directly from the source. By the time wood arrives at Home Depot, many brokers have added their costs into the price of the wood. But while Welters and Pond are happy to work with locally harvested wood, milled and finished in Vermont, they will do whatever the customer wants. For example, the five-inch white oak Green Mountain Eco Floors installed in the recently expanded Three Penny Taproom came from out of state. But even still, Welters said they got a great price on that wood. Pond is a second-generation wood flooring installer. Recently he was working in Oregon and he has contacts with hardwood wholesalers that Green Mountain Eco Floors can buy from directly. And it’s clear from chatting with Welters that he loves his job. He said he can talk about wood flooring all day long. Every floor, Welters said, is dramatically different. Every house is different, and he said that what he loves about this business is talking to people. Welters said he’s happy to give free estimates and help people figure out what they want, whether they decide to go with his company or not. But considering he can beat any of the brick and mortar stores on prices, Welters said that if they get called out to bid a job they will get the job.